The 1961 war classic is gearing up for a mid-October Blu-ray release! 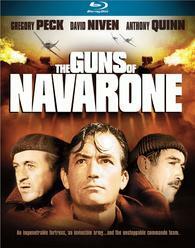 In an early announcement to retailers, Sony says 'The Guns of Navarone' is planned for a Blu-ray release on October 18. The film starring David Niven, Gregory Peck and Anthony Quinn was nominated for seven Oscars including Best Director and Best Picture and claimed Best Effects/Special Effects. The Blu-ray will feature 1080p video, a DTS-HD Master Audio 5.1 soundtrack, and will be packed with supplements including: Audio commentaries with director J. Lee Thompson and film historian Stephen J. Rubin, the narration-free prologue, the roadshow intermission, Memories of Navarone retrospective documentary, The Greek Resistance, The Old School Wizardry of The Guns of Navarone, World War II and the Greek Islands, The Real World of Guns of Navarone, The Navarone Effect, Military Fact or Fiction, Forging the Guns of Navarone: Notes from the Set, Ironic Epic of Heroism, Epic Restoration, A Heroic Score, Message from Carl Foreman, Great Guns, No Visitors, Honeymoon on Rhodes and Two Girls On The Town. Suggested list price for the Blu-ray is set at $19.99. You can find the latest specs for 'The Guns of Navarone' linked from our Blu-ray Release Schedule, where it is indexed under October 18.